After decades of dithering, posturing and procrastination on global environmental issues, 2015 appeared to be a banner year for sustainability. Growing recognition of environmental threats finally triggered waves of public concern and more resolute official stances. In September, 193 member countries of the UN General Assembly agreed on a plan of action entitled The Sustainable Development Goals (SDGs). In December, 195 countries gathered outside Paris to negotiate a new agreement on climate change. Instead of mandating universal limits on the emission of greenhouse gases – which have been habitually ignored – individual countries pledged their own emission caps. Shortly thereafter, President Obama’s last State of the Union Address surprisingly cited climate change as the second of four major questions that his country needs to address in coming years. Despite such positive signs, environmentalists remain skeptical about humankind’s willingness and ability to deal effectively with threats of ecological catastrophe. Most see it as too little, too late. What exactly is amiss? Answers vary according to proponents’ knowledge, experiences, convictions and disciplines. We of the population field are prone to lament – as Livi-Bacci did in a recent essay on this site – that demographic issues have disappeared from the discussion. True, given the sensitive nature of population topics, particularly those related to reproduction and international mobility, major forums such as the IPCC (Intergovernmental Panel on Climate Change), SDGs (Sustainable Development Goals) and COPs (Conference of the Parties) tend to bypass these issues in order to facilitate unanimity on other questions. But it could also be argued that we have ourselves contributed to this deficiency by allowing the discussion to focus on an oversimplified agenda. Population dynamics are obviously important but their significance in the environmental quandary is subordinate to humankind’s main pursuit over the last century, namely – “development”. Going back to Obama’s speech, we find that his first priority for the country was economic growth. In this respect, Obama was simply reiterating the only policy that commands unconditional support – despite the fact that it clashes directly with his proposed reduction of climate change risks. Not by coincidence, economic growth was also at the heart of the SDG’s plan of action; as justified by the plan’s mentor, Jeffrey Sachs, and formulated in Goal #8, “sustained economic growth” is a requisite for sustainability. Growth also overshadowed the Paris Conference, which did not oblige countries to honour their own commitments: experience tells us that few of them will let such targets interfere with transcendent economic objectives. When assessing the root causes of threats to planetary boundaries, scientists are practically unanimous in attributing them to human activity, more specifically to the production, consumption and disposal of material goods. Cheap energy from fossil fuels combined with technological progress to propel rapid economic expansion that has consumed natural resources at a gargantuan pace and spawned the culture of consumption. This ethic, propagated efficiently by a humongous advertising industry, has convinced us that happiness derives from buying more stuff, thereby guaranteeing the constant increases in production that drive economic growth. Globalization has universalized this culture and sanctified GNP as the primary object of both national governments and international development agencies. Small wonder that it found its way into the heart of the SDGs! The problem with this persuasive arrangement is that producing and consuming stuff to guarantee GNP growth demands a constant flow of matter and energy from the natural environment. Substitution of fossil fuels by renewable energy sources is desirable but certainly not a panacea given increasing rates of consumption. Economic growth underlies today’s critical ecological problems – which extend far beyond the climate change issues that command most attention. For instance, increased anthropic activity has resulted in the depletion of ecosystems and the drastic reduction of biodiversity. More generally, human demand already surpasses the regenerative capacity of the planet by 50%. Planetary boundaries have already been transgressed in four of the nine critical processes that regulate the stability and resilience of the Earth system. In brief, the prevailing economic paradigm is taking us towards an unsustainable future. As famously observed by Kenneth Boulding: “Anyone who believes exponential growth can go on forever in a finite world is either a madman or an economist”. Robert Constanza compares strategists who purport to cure environmental ills with customary formulas of economic growth to drug addicts who always need more of what they’re addicted to, even though it’s what’s killing them in the long run. Population = Consumers = Emissions? So – where does population fit into this equation? Obviously the more people who are consuming, the faster the rate of degradation under the present system. Reducing population size is part of any long-term solution. Yet, it is disingenuous to cite population size and growth as the main culprit of environmental degradation or to suggest that family planning programs could provide a quick fix. Indeed, population decline is a slow process – as the Chinese case illustrates dramatically – and fertility reduction itself is associated with increased per capita consumption within smaller families, thus minimizing the effects of a reduction in size. What really matters is who has access to “development”, such as we know it. Of the 7.3 billion people currently on Earth, only a third can be minimally construed as “middle class” consumers and the remainder contribute marginally to insoluble global environmental threats. It is easy to forget that the current ecological chaos was actually created by a minority of the world’s population – that of developed countries together with the elites of less-developed areas. Globalized development is rapidly increasing the number of consumers, with detrimental ecological consequences. Under the current paradigm, it is simply absurd to imagine that the current living standards of the richer minority can be adopted by the entire world population – whether of 8 or 15 billion – without drastically overstepping planetary boundaries. Yet, current levels of inequality already magnify the contradictions between the values embedded in the western culture of consumption and those of other societies; this helps raise voices of indignation in ever more violent ways, contributing to conflicts, terrorism, refugee crises and other global ills. Humanity’s greatest dilemma today consists in reducing poverty and inequality in the world without further transgressing planetary boundaries. The chances of meaningful progress towards this goal via the SDGs are poor. The world is facing serious and mounting problems in economic growth, social well-being and environmental sustainability. Focusing everyone’s attention on a slew of indicators rather than on the global political economy that creates these problems is unlikely to generate needed changes. Similarly, the promises made at the Paris COP meetings are not binding and, even in the unlikely event that they were respected, their results would fall well below the minimal requirements for reducing climate change to acceptable levels. 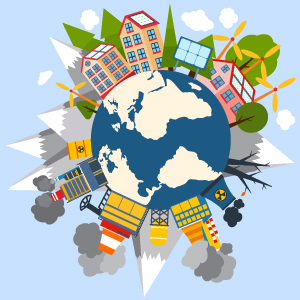 The promises of green or circular economies, or better technologies and regulations will all fail without a radical transformation of political and economic institutions and the replacement of current development policies with shared prosperity objectives that produce a drastic reduction in global demand. Substituting our consumption-fix with less materialistic values is imperative but, regrettably, unlikely to occur before greater calamities shake our deeply-ingrained complacency. MARTINE, G. and J.E. ALVES – Economy, Society and Environment in the 21st Century: Three Pillars or Trilemma of Sustainability? MARTINE, G. – Reviving or interring global governance on sustainability? Sachs, the UN and the SDGs. Bright Forecast for Chemists. Angew. Chem. Int. Ed. 2013, 52, 2667 – 2672. ²GORDON, Robert. The rise and fall of American growth: The US standard of living since the Civil War. Princeton University Press. 2016. ³BARNOSKY, A. D. et al. Approaching a state shift in Earth’s biosphere. Nature, v. 486, p. 52-58, 07 June 2012. Cf., inter alia, the works of Vaclav SMIL, Naomi KLEIN and Ted TRAINER.